“Water, water everywhere, nor any drop to drink”. If you’re travelling for business or pleasure and find yourself in a developing country with questionable levels of hygiene, finding safe drinking water may be a tall order. With this in mind, Hydro-Photon has come up with an electronic wand that can clean water to ensure it is safe for drinking. The SteriPen JourneyLCD has a liquid crystal display (LCD) that indicates the remaining time left in the purification process and beams a smiley face to the user when the process is ended. The magic wand can clean up to one quart of water and rid it of bacteria, viruses and protozoa within 90 seconds through its high frequency light. Users only need to swirl the water thoroughly with the wand for it to work. The photons released by the ultra-violet bulb in the wand will damage the DNA of harmful organisms in the water. The SteriPen JourneyLCD is light and portable, weighing only 140 grams. It is operated by two batteries. The wand has an expected shelf life of 10,000 treatments or 2,500 gallon of water. The wand is installed with safety features to protect users from the ultra-violet rays. It comes with electrodes or water sensors which ensure that the device is only turned on when it is immersed in water. Apart from anxieties about the ultra-violet rays, however minimal, the SteriPen JourneyLCD has another disadvantage. It doesn’t work with murky water or drinks other than plain water. The ultra-violet light meant to destroy harmful organisms will be deflected if there are particles such as dirt, colour or tea leaves in the water. This gadget is suitable for the globe-trotting businessman, tourist, adventurer, hiker, camper, or scientist who may not have access to clean water. It is better than using iodine tablets which make the water smell and taste weird. 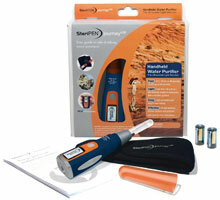 In short, the SteriPen JourneyLCD makes a perfect gift for someone who likes outdoors and values their health.